Why hello there! Thank you for stopping by! For those of you who don’t already know this, signature cocktails are my thing. Join me as I reminisce about my favorite signature cocktails and talk about ways to come up with one for your next event. Also, be sure to leave me a note in the comments telling me what YOUR favorite cocktail is! Oooo how do I love thee champagne, let me COUNT the ways! Champagne bars are great if you are having a smaller event where people can serve themselves. 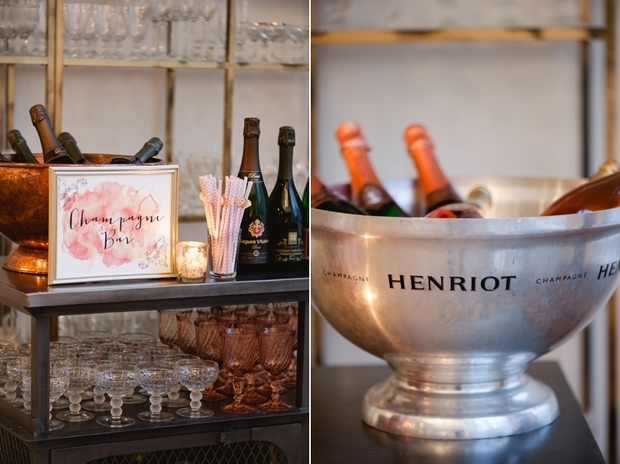 Debi Lilly, of A Perfect Event, threw this fantastic bridal shower trends party where she incorporated floral ice cubes, adorable straws and gorgeous glassware from The Festive Frog into her champagne bar. It was a big hit! Talk about a trendsetter! Bar carts have made a comeback in the last few years, inspiring us all to curate our barware and, in turn, try our hand at craft cocktails at home. 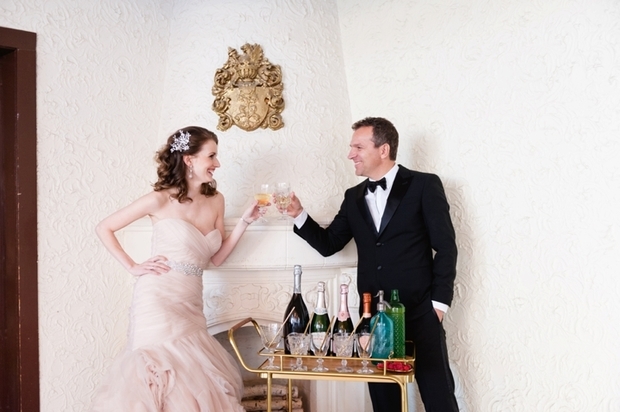 I have enjoyed collecting different decanters, glassware and decor items while styling our cart. I’ve even attended a few ‘stock-the-bar parties’ for friends who recently purchased houses or condos. Great idea, right? Ok, I admit I am a champagne fiend. 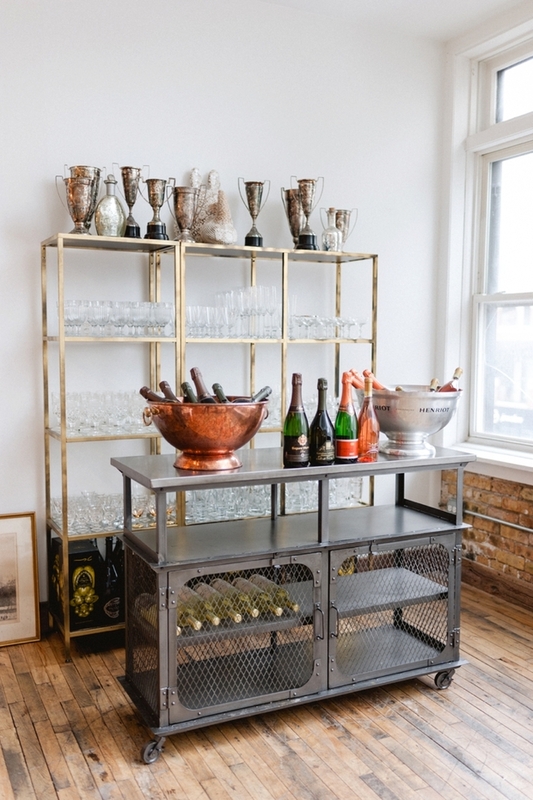 I love the idea of champagne bars because they are so versatile. You can use them any time of day or night. Who doesn’t love a good mimosa at brunch now and again? Here, I created a champs bar with different flavored syrups (homemade, oh snap!) and craft sodas. In addition to that, I put out herbs and berries as garnish in case someone wasn’t feeling the sugary soda. These mini Freixenet bottles were perfect! They looked tres chic, are super affordable and worked well as take-home favors. To see more from this bridal shower tea party event, visit Wedding Chicks. Classic cocktails are always a great choice and never go out of style. Most people have heard of, tried and (hopefully) like some of them. As a result, they work well for cocktail/dinner parties and weddings. When I photograph weddings, I often see either an Old Fashioned or Negroni on cocktail lists. This one is fun. Incorporating your heritage into your signature cocktails is a great way to share a bit about your culture with guests. Here we have “his & hers” cocktails using Aquavit, a Scandinavian liquor. The particular aquavit used in the cocktails–Linie–is special because each barrel is shipped around the world, from Norway to Australia and back, crossing the equator twice during the journey. They claim that the rocking in the boat, the ocean air, and the changes in temperature and humidity all go toward making it taste better. Check out how this couple integrated other aspects of their Scandinavian heritage into their wedding here. Please, please don’t be afraid to go BOLD! Parties, events & weddings are meant to be fun, unique and tell a story. Integrating interesting themes, spaces/venues, decor items and cocktails sets you apart. Consider this bohemian neo-gothic wedding inspiration, featured on Burnetts Boards. Our signature cocktail, the Solstice 75 from RM Champagne, (available on their menu) is a light and refreshing blend of eucalyptus and black pepper infused Aviation Gin, Cassis and Cava. Simply delicious and perfect for a bohemian Gothic affair. Our signature cocktail was a ‘Chicago Mule’ featuring CH Vodka & Goose Island ginger soda (both Chicago companies). To see more of how we incorporated Chicago vendors, you can see our feature on Style Me Pretty. If you are feeling less than inspired, consider checking out what is ‘in season.’ Holiday cocktails usually incorporate seasonal flavors and are fun and festive. Serve sangria/margaritas in the summer, Bourbon cider in the Fall, and a white Cosmopolitan in the winter. Can’t go wrong. Yum! For emerald wedding inspiration, check out THIS POST. Lastly, think of ways you can incorporate your favorite liquors, seasonal fruits, herbs and unique flavors into your cocktails. Also, consider the presentation. Trays instantly give a little pizzazz, and adding a menu is super easy and affordable. You could easily whip something up on your computer, cut it out, and place it in your favorite frame.